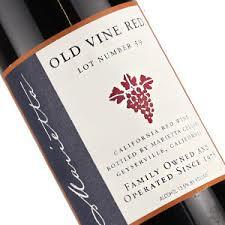 Marietta’s Old Vine Red wine has been one of my favorites for a long time, and I’ve been with this one long enough to have noted some big swings in quality. It’s a blend, made up mostly of old-vine Zinfandel. I generally like Zinfandels, anyway, but some of the wines I’ve liked best of any have been old-vine Zins. I don’t really know what qualifies a vineyard as having “old” vines. But the wines that get labelled “old vine” usually have dark, almost raisin-like notes and enough complexity to keep your head spinning for several minutes. Marietta labels these by “Lot” rather than year, and they’re up to Lot 60. I think the first I ever tasted was in the low 50’s or high 40’s, and I seem to recall that Lot 54 was one of the best. Then they had a couple of bad years, and there was one lot — I think it was 57 or 58 — that was hardly worth drinking. But in the last few lots, they’ve brought it back. I don’t think 60 has come all the way back to the legendary Lot 54, but it’s darn fine wine, and something I want in the rack if I start experimenting with odd labels. That way, if all my adventurous choices are terrible, I can just dump the swill, open a bottle of Old Vine Red, and soothe the raw palate.